Heat olive oil in pan on MEDIUM-LOW 1-2 min. Add bacon; cook 5 min. Add mirepoix; cook, stirring, 5-7 min, until soft but not browned. Add stock; bring to simmer. Stir in lentils; mix well. Cover. Simmer gently 50-60 min, until liquid has been absorbed and lentils are tender. Season with basting oil, salt, and pepper. ***Susan's Note: Since the fall began, I've been craving roast chicken and I've made this recipe with boneless skinless chicken thighs, boneless skinless chicken breasts, and drumsticks too. Drumsticks take longer to cook (45 min.) than boneless / skinless thighs or breasts, which will only need about 25 - 30 min. I also use baby carrots - it's easier - and they are surprisingly delicious. This is EASY! Don't worry about the type of potatoes. I've used baby red potatoes, the Yukon Gold recommended, or a potato blend from Wegman's with red, blue, and white fingerling potatoes. All turned out well. Preheat oven to 425 degrees. Toss together carrots, 1 tsp. olive oil, and 1/8 tsp. salt in a bowl. Spread out evenly on a baking sheet and bake until carrots begin to soften, about 10-15 minutes. Meanwhile, combine mustard, garlic, chopped rosemary, 1/8 tsp. salt, 1/8 tsp. freshly ground black pepper and 2 tsp. olive oil in a small bowl. Whisk together until well combined. Rub mixture over chicken thighs & legs to coat. Toss together remaining tsp. oil, 1/8 tsp. salt and the potatoes in a bowl. 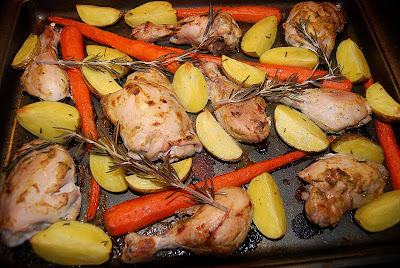 Remove baking sheet from oven and add chicken, potatoes, and rosemary sprigs to the carrots. Bake until chicken is golden brown (or a instant read thermometer inserting into the thickest part registers 165 degrees) approximately 45 minutes. Squeeze lemon over top and sprinkle with pepper. ***Susan's Note: I had a bunch of cans of beans and tomato sauces and stuff that I wanted to use up, so I found this recipe on allrecipes.com. It was easier to put together than the other turkey chili recipe on my blog. This recipe recieved 502 reviews, with an average of 4 1/2 stars. What makes me laugh, though, is that most of the reviewers modified the recipe. I did, too!! I cooked it on high for 4 hours and it was yummy!